Founded in 1990, Kidspace Child and Family Development Center is a nationally accredited child development center for children ages six weeks through five years old. 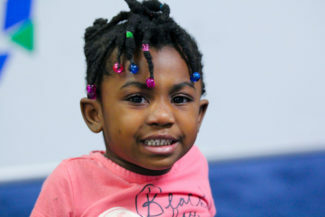 The children are from families that are homeless and living at House of Ruth or other programs in the District of Columbia. At Kidspace, children have individualized learning and care plans to help them achieve their highest potential. In bright, engaging classrooms, each child is taught by nurturing, well-trained teachers. The goals are to help the children develop skills and autonomy; to promote a life-long love of learning; to increase communication skills; and to promote positive development. Being born into a homeless family is very hard on a little child. In fact, every child entering Kidspace has delays across all developmental domains. The enriched learning environment helps many of the children achieve their developmental milestones. For children who need more help, speech and language therapy, psychotherapy and occupational therapy are provided on-site. 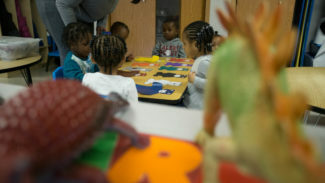 In addition to offering a safe, nurturing and educational environment for the children, Kidspace provides parents with counseling, support, advocacy and connection to resources in the community. Social workers work directly with the parents to help them address their issues and involve them as positive actors in their child’s education. Parents are expected to commit to improving the situation of the family. Assistance is provided to parents with many issues, such as housing, education, training, health care, and employment. Children who have special needs are given additional help. The staff works closely with parents of these children to gain the resources to meet special needs once the child leaves Kidspace and enters kindergarten. We offer healthy meals to all enrolled children as part of our participation in the U.S. Department of Agriculture (USDA) Child and Adult Care Food Program (CACFP). Neither you nor your child must be a U.S. citizen for your child to receive meals, or for the center to receive reimbursements. All children enrolled at our center receive meals free of charge.